Replatforming your online store can create big sales upside for you. And today, big financial gains are a must. But you need to justify your investment of time and dollars. Plus, you need to mitigate the customer experience risks of migrating to a new e-commerce platform. 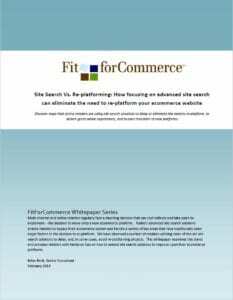 Discover how online retailers are using site search solutions to ease transition to new platforms. Download this in-depth white paper to help make your replatforming project better.